I don't think I'll require nine separate posts to cover the third day of our recent trip to Japan's Ishigaki Island in the East China Sea, but we'll see. 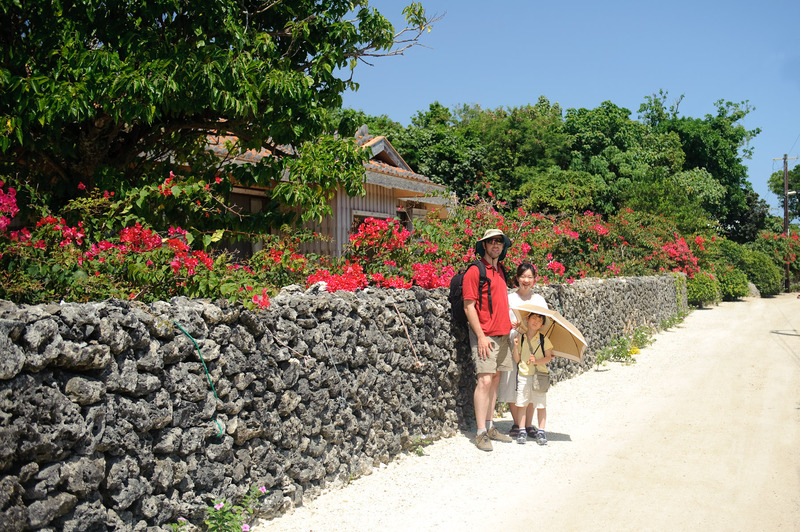 A few miles off the south-west coast of Ishigaki Island is the tiny Taketomi Island, known for its quaint culturally-unique village. Most lanes in the village are lined by three things: coral walls, pretty flowers, and ugly utility poles. Construction is under way to bury all the wires and get rid of the poles, so I've taken the liberty of doing so retroactively to the photo above, taken of us by a kind stranger. The walls of stacked coral blocks are similar to those on far away Kakeroma-jima. Which brings us to today's quiz: what color are the flowers that line the lane in the photo above? I think the color is called coral. But I’m not a color or flower expert by any means. But more importantly, it pleases me to see how much time you spend with your family, and especially your son. Those moments are precious and create memories that will last many years to come. All the best to you Jeffrey. P.S. I’m making a donation today since I use your plugins and want to support your work and generosity. I am assuming you are talking about the flowers on top of the wall? They look red on my screen, but they also look blown out (probably the red channel? ), so they might actually be a different tint such as purplish. My mother in law has some shrub type vines that produce flowers like those. . Are they bougainvillea red? I’m not very confident about this. She used to have orange ones and some that are almost yellow, but she calls all of them “bugenbiria” in Japanese. I’m probably thinking of an entirely different flower. As I was looking for the proper spelling online, I came across a site that had a bunch of varieties with photos. One particular one that looked like the ones my mother-in-law has, which looks like the ones in your photo, is called “Scarlet O’Hara”. So if they are the same flower, maybe scarlet? In the end, I don’t know what color they are. I just took a stab. LOL, I just now noticed the parenthesis in nils’ comment. I looked everywhere for that stupid spelling! “line the lane…” This may be a Do’h moment. I’m going with Goldenrod! I say deep|dark pink bougainvillea.